Blind Signal is an event series dedicated to the exploration of electroacoustic performances and contemporary music hosted in a Godless Church, which is today a GDR resistance museum — in the heart of Friedrichshain. This fifth edition is part of the Month of Contemporary Music. 7PM ESC.4 by Marianne Jacquet is an interactive, in-situ installation that uses sound, wood logs and digital technology to reveal non-visible relationships with the ​in-between. By amplifying the viewer’s movement and absorbing their impact into the music score, ESC questioned the sensitive intersections between physical and immaterial realities. Inspired by the Twin Peaks’ character “The Log Lady” who used her log like a receptor to communicate with the spirit world, ESC operates like a Greek tragedy choir, transcribing the viewer’s behaviour into ghostly sounds between the natural and the supernatural. ESC 4 was realized during the AUSLAND art residency program in Berlin in 2018. 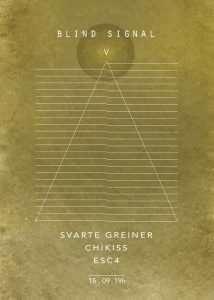 8PM Svarte Greiner is the solo guise of Berlin-based Norwegian Erik K. Skodvin (Deaf Center, B/B/S). Founder of Miasma Records and the Acoustic Doom genre, he works mostly with darkly painted soundscapes through bowed guitar, effect-pedals and varied sound-making tools. Skodvin’s music and (rare) live performances can be seen as something of a time stopping cinematic experience, he is a master of enveloping the listener into a world that is both monumental and suspenseful. Erik K. Skodvin has also toured and worked with a broad selection of varied artists, from Fever Ray to Johann Johannsson, Nils Frahm, Andrea Belfi & Aaron Moore to name a few. 9PM Chikiss aka Galina Ozeran is a singer-songwriter, composer, producer, pianist, and dj. Born in Vitebsk, Belarus, spending 15 years in St.-Petersburg, she is based in Berlin since 2015. Having released her first album in 2010, Galina Ozeran has created numerous wide-ranging projects, from contemporary piano and electro-acoustic pieces to nostalgic synth-pop songs, noise-rock and spectral electronic avant-garde music – all as a solo artist and in collaboration with others. As a child of Soviet-era sci-fi, Chikiss tinted by the faded glory of suggested futures that never came to be. Her performances draw on nostalgic futurism, both brand new and nodding to obscure numbers by long forgotten and little known internationally soviet acts. Armed with encyclopediac knowledge of early synth recordings, depicting mischievous romantic mechanical dreams brought into life by analogue machines. For the first time she will perform a spectral-pop, sound-landscapes improvised show around her New Season album, with live visuals.